Sitemap: PST repair without scanpst. Repair PST files easily. PST Repair for Outlook and DBX repair for Outlook Express. Download and try Recover My Email now. Email recovery from Outlook and Outlook Express. Frequently asked questions. Inbox Repair Tool for Email Recovery - Download Here. How to restore you PST and repair the damage done. 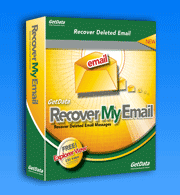 Recover My Email is the one stop solution to the problem. Download Recover My Email for Outlook and see deleted email messages inside Outlook PST files. Download and execute Recover My Email for Microsoft Outlook - the quick and easy way to recover your deleted Outlook email. GetDatas Recover My Email for Microsoft Outlook - Register your software today and our recovery software recovers your lost or deleted Outlook .PST files. Mail recovery has never been made more simple than it is with Recover My Email. For both Outlook & Outlook Express, inbox repair is a simple task. Download and try it now. Scan PST not helping? Download Recover My Email and find that PST file repair and recovery has never been easier. Quickly and easily recover email deleted or lost from Microsoft Outlook or Outlook Express. Download and use Recover My Email here. Recover My Email Posteingang Reparatur Tool fuer Outlook und Outlook Express Email Rettung. Jezt downloaden und gerettete Emails in der Vorschau sehen! Recover My Email herunterladen und sofort ausfuehren - der schnellste Weg, Ihre geloeschten Outlook und Outlook Express Emails zu retten. Recover My Emails fuer Microsoft Outlook von GetData rettet geloeschte und verlorene Outlook .PST Dateien schnell und unkompliziert. Schnell und einfach geloeschte Emails wiederherstellen: Screenshots zeigen Ihnen detailliert, wie Sie geloeschte Email Nachrichten in Outlook und Outlook Express retten. Recover My Email fuer Outlook herunterladen und sofort geloeschte Emails in Vorschau fuer Outlook PST Dateien sehen.